Jeff Landry, a Wal-Mart employee in Sapulpa, Okla., said he is joining the Black Friday protest to fight back against retaliation. He said his hours were cut after he complained to managers about his schedule. The stage has been set for a battle between a group of Wal-Mart (WMT) workers and the retailer on Black Friday. The union-backed group OUR Walmart expects thousands of workers to participate in the protest planned this week. The employees will ask the country's largest employer to end what they call retaliation against speaking out for better pay, fair schedules and affordable health care. Such retaliation can include shuffling around their shifts, cutting hours and moving them around departments. 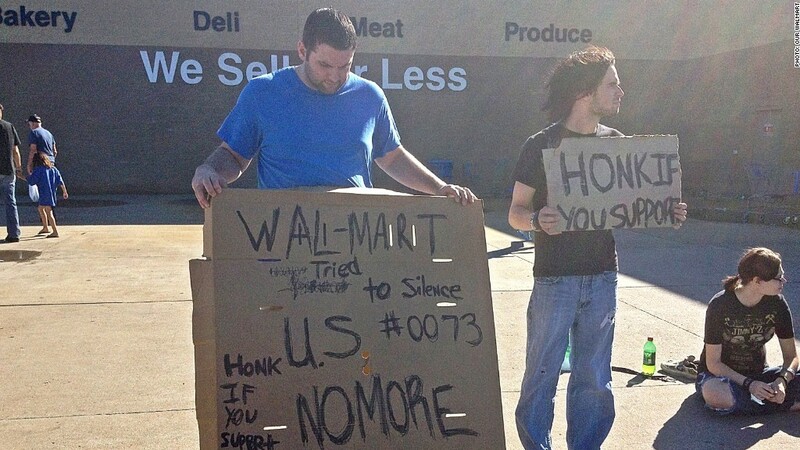 Wal-Mart says that the protesters make up just a handful of its 1.3 million workforce. In an effort to stop them, Wal-Mart filed a complaint last week with the National Labor Relations Board, claiming that the United Food and Commercial Workers Union and its subsidiary known as OURWalmart unlawfully organized picket lines and other demonstrations in the past six months. The retailer said the actions have disrupted business, and that workers' ongoing actions violate the National Labor Relations Act, which prohibits picketing for any period over 30 days without filing a petition to form a union. Representatives of the federal agency are currently holding talks at Wal-Mart headquarters in Bentonville, Arkansas, about the complaint. Nancy Cleeland, a spokeswoman for the agency, said in an email that a decision from the agency is not expected before Thursday. Courts won't be open that day to grant an injunction because of the Thanksgiving holiday, meaning that no action will be taken in time to block the planned Black Friday walkout. Cleeland said there are currently about 20 charges filed against Wal-Mart stores by individual employees and OUR Walmart alleging a number of illegal acts. She wouldn't say what the specific charges are. OUR Walmart, which gets financial backing and other support from the UFCW, says that it is specifically protesting against the company's retaliation against its employees and doesn't have specific demands tied to the Black Friday walkout. However, in 2011, the group asked the retailer to pay workers a minimum wage of $13 per hour and to make more full-time jobs available for its part-time employees who want them. It also asked the retailer to provide affordable health care, predictable hours and to recognize freedom of speech and association. Wal-Mart would not say what percentage of its workers are part-time, or how much they are paid on average. Tovar said that a majority of its employees are full-time workers, who get an average hourly wage of $12.40, about $5 above the federal minimum wage. Jeff Landry, an employee in Sapulpa, Okla., plans to join the protest. He works from 4 to 9 p.m. after attending school all day. When he was scheduled for a shift during class, Landry complained. He says his managers responded by cutting his hours from 40 to below 30 a week. This meant that Landry was no longer eligible for health care, since Wal-Mart requires workers to work an average of 30 hours per week to get benefits. "They tried all these tactics to get rid of me," he said. Landry has his job despite joining a walkout last month, when a protest that started at a Wal-Mart in Los Angeles spread to stores in 12 other cities. Wal-Mart spokesman David Tovar said Wal-Mart has a policy that prohibits retaliation of any kind, and investigates every allegation. Labor law experts say that if true, the employees' claims would violate terms of the National Labor Rights Act, which protects workers against that kind of retaliation. Angela Cornell, director of the labor law clinic at Cornell Law School, said that Wal-Mart's complaint might not work because labor laws that prohibit picketing over 30 days applies only to protesters trying to form a union or gain collective bargaining rights, not employees who are protesting against retaliation. According to William Gould IV, who was chairman of the NLRB under President Clinton and is now a law professor at Stanford University, the law protects employees protesting employment conditions. He also said that it would be unusual for the federal agency to conclude an investigation of this size within a matter of days, or in time for Black Friday. Both Gould and Cornell agree it is likely that the retailer is using the complaint as a way to deter workers from taking part in the walk offs. "It appears to me that the main motivation is...to make some employees decide not to participate, even though their activities are protected," Cornell said.